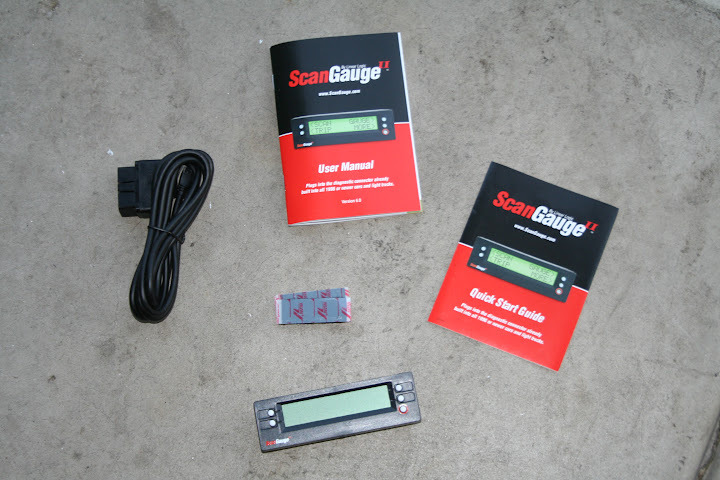 I learned about ScanGaugeII just over a month ago - I had never thought about a product like this even though I know what an OBD computer is and what it does. I do cars and consider myself an enthusiast, so I was pleasantly surprised when I stumbled upon the ScanGaugeII. In fact, as soon as it caught my eye, I immediately started researching the features. But what's worth noting is how I learned of the product, because it wasn't the traditional manufacturer's marketing efforts that introduced us to each other. To set the stage you should know that I own and love my 2002 Subaru Impreza Outback Sport - it's one of those love/hate relationships because I love the car so much for its ruggedness and reliability but I hate it because it won't die and give me an excuse to buy a new one. But what's relevant is that it's approaching 150,000, is pretty much stock, has been extremely reliable, and only recently started showing hints of its age. The check engine light began turning on and off intermittently - on for a few days or weeks then off for the a few days or weeks. I'd stop by the local parts store to do an OBD scan each time the light came on. I did this just to be sure it wasn't a new code. For those who are wondering, it was P420 which is flow issue in the catalytic converter. With that issue consistently popping up, I started looking into OBDII scan tools - like the ones used at the local auto parts store. I didn't want to pay $80 for something that I'd be using every now and then so I kept poking around online part stores and discussion boards. Eventually, I found a post mentioning the ScanGaugeII device on the North American Subaru Impreza Owners Club website. I went back to the part store website that I frequent and looked for it there - wondering why I missed it. Turns out, I didn't miss it because it didn't turn up in the search results. I had included the term "OBD" and that seemed to be just enough to exclude the product from the search results. In any respect, the product seemed to be exactly what I wanted - a permanent OBD reader that could give me a snap shot of what my car's computer was tracking. "Sweet" and I might have said that out loud having stumbled across it online. Every image I found of the product was clean, not cheap - including the packaging. As I look or find products online, it is so easy to find products poorly presented so it was nice to see this product coming off as having its act together. When I received the product in the mail, there wasn't anything to be overly impressed about - it came in a box of packing peanuts - but obviously nothing to be depressed about either. I was very pleased as I removed the item from the box as it had everything you needed to hit the ground running. What is most worth noting is the fact that it was packed with a quick connect guide along with the user manual. This made me feel like I was moments away from seeing the device in action. Overall, every aspect of my first impression was extremely positive. But, that also set my expectations high. I went from thinking there wasn't a permanent OBDII Reader out there to finding one that is small and could easily find a place in any number of spots in my car's interior. I really like this thing. After reading the quick connect guide AND the manual (highly recommended) I learned more about just how many cool things you could do with this. Now, I was more worried about whether or not I would ever get around to taking advantage of all the features it offered. But in time I would make sure I did in some way shape or form. Pretty much everything about the product is great. I liked the size of the device as it was amiable to be mounted almost anywhere I could imagine - be it for convenience and use or for a seamless presentation. I was able to successfully mount the device in place of my OEM center dash clock. The initial set up is simple and, as stated, only gets you ready for some features. Following the manual was easy enough so the advanced functionality was available to me in minutes. So I really liked how easy the set up turned out to be. Using the device is also easy. Switching which gauges you want displayed is intuitive and having the home button is a nice fail safe - I always like products that give me a "I've gone too far, get me outta here" button and that's what the ScanGaugeII home button does - if you're aimlessly pressing buttons you can always hit the red circled button to pull you out without screwing your configurations up. The variety of gauges to choose from was great. For my normal commute (44 miles one way, mostly highway) I select the gauges/displays related to fuel economy: i.e . cost per mile, average mpg, etc. On the weekend, casual city driving, I select other displays like the Intake Air and Water Temperature. Since my car is older, I'm beginning to monitor the manifold absolute pressure (MAP). The backlight display can even be customized. I was able to match the color with my dash lights so everything looks like it belongs. I really couldn't find much to be too picky about. The "home" button is in a sort of odd spot. I think what I would do is move it to the right side, vertically centered on the outside of those two buttons. Then, add a button on the other side, similarly positioned, that toggles between saved gauge sets. If someone was holding a pickle under my nose (I can't stand pickles) and demanded I find something else wrong with this device, I could only comment on the data refresh rate - to be fair, this may be a technical limitation of the OBD. I did find the setting where the refresh speed is managed, so I put it on the fastest setting. The refresh rate is fine, but in this day in age it just feels like it could be quicker. Think of it like the NBA's shot clock without the tenths of seconds displayed. There is nothing ugly about this product to point out. I could probably mention the buttons or the fact that you have a cable coming from a spot one was not designed to come from (the OBD port of your car). But it isn't anywhere close to being as ugly as having a radar detector and GPS device plugged into a cigarette lighter jack with one of those two-to-one adaptors. I'd like to see an additional cable/port coming from the device (or the one converted) with a USB port on the other end. With that, I'd have the device export data through that port to a thumb drive - make it to any thumb drive or a proprietary one that can be used like any other. Since the ScanGaugeII has a limited amount of memory, it can only store so much. If this product is going to have a future and compete against OEM infotainment systems like Ford's Sync and if it wants to continue to lead the way for other OBDII devices, it needs to record the data and offer the ability to analyze it. I realize this can be done in the car (to an extent) but only for the last couple of trips or performance runs. So imagine this. Picture yourself sitting down in the car, turning the engine on and inserting your thumb drive into the device. The ScanGaugeII notes a successful connection and creates a new file on the drive (current date and time). As you drive off the device manages a log, updating all the information the device reads from the OBD. When you're done, your thumb drive has all the data from your trip. You get home and you plug the device into your computer. Your ScanGaugeII software opens and uploads your data to the ScanGaugeII website (if you've paid your subscription). The data is mined and a plethora of reports are available for your analytic pleasures. Alternately, a SmartPhone APP could be available and information could be directly transferred there from the USB port extension. When I look at the target audience for this product, hyper-milers (geeks and fleets) and performance tuners, I see the future in the analytic value this device could present. I see a community of users sharing their information in a centralized location - i.e. scangaugecommunity.com. With the information uploaded by the consumer to this site there are a number of things that can be done. Each user would have a profile where their information can be tracked, analyzed and reported upon - giving each user a complete history of their vehicle. Information would then be aggregated across the community and finally, mined (and sold) to the OEMs for more in depth analysis. Various levels of subscriptions could then be created for both the consumer and the business. Unless more information is going to be made available in the OBD computers, product features are finite. While those are explored or tapped out, I see an opportunity for growth by jumping on the social media bandwagon by establishing that online community where people can share and compare their findings.